Are you stuck in a life you want to be different, but have no idea where to start? You will never regret taking charge of your life and living with gratitude. The journey is rewarding and challenging. It takes only 30 minutes each day to make progress with your future, one day at a time. A portion of the book's proceeds will support BridgeHope, whose efforts enable survivors of exploitation and trafficking to THRIVE! Allie Hudson grew up in LaGrange, Ohio, and attended Moody Bible Institute, studying education. In 1991, she married Larry Sellers, who passed away of a heart attack in May 2009. In 2010, she married Michael Hudson who passed away of cancer just three years later. In January 2012, Allie lost her corporate job of 20 years because of downsizing in the newspaper business. Throughout this five-year period of three major losses, the only way she survived was to focus on God and trust that He had a plan for her life. After struggling to maintain a daily consistent practice of growth and gratitude, she began a 40-day challenge to practice gratitude and personal growth. 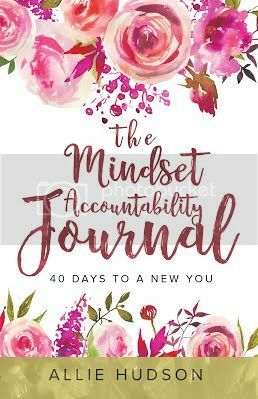 That journey taught her the need to help other people develop a daily practice of thankfulness and inspired her to share 'The Mindset Accountability Journal' with the world.